In the lawsuit, the federal government alleges that KleinBank violated the Fair Housing Act and Equal Credit Opportunity Act. The lawsuit says that from 2010 to at least 2015, KleinBank structured its home mortgage lending business to avoid serving neighborhoods where a majority of residents are racial and ethnic minorities. Specifically, the lawsuit says, the bank excluded minority neighborhoods from its service area, located its branch offices and mortgage loan officers in white neighborhoods but not in minority neighborhoods and targeted its marketing and advertising solely toward residents of white neighborhoods. Comment: Image sources: Snap from KleinBank locations site & Google maps. My view: No real evidence of discrimination! Feds should employ black secret shoppers to demonstrate real discrimination! Update 1/17: Bank says not having Mpls., St. Paul branches is good business, not discriminatory. KleinBank officials denied the charges, saying they have been cooperating with Justice Department officials for more than a year. "The government's claim of 'redlining' has absolutely no basis in fact," Doug Hile, KleinBank president and CEO, said in a written statement. "To the contrary, KleinBank has an established history of responding to all credit requests with a commitment to fairness and equal opportunity." The lawsuit is the first of its kind involving a Minnesota-based bank, said Joe Witt, president and chief executive of the Minnesota Bankers Association. 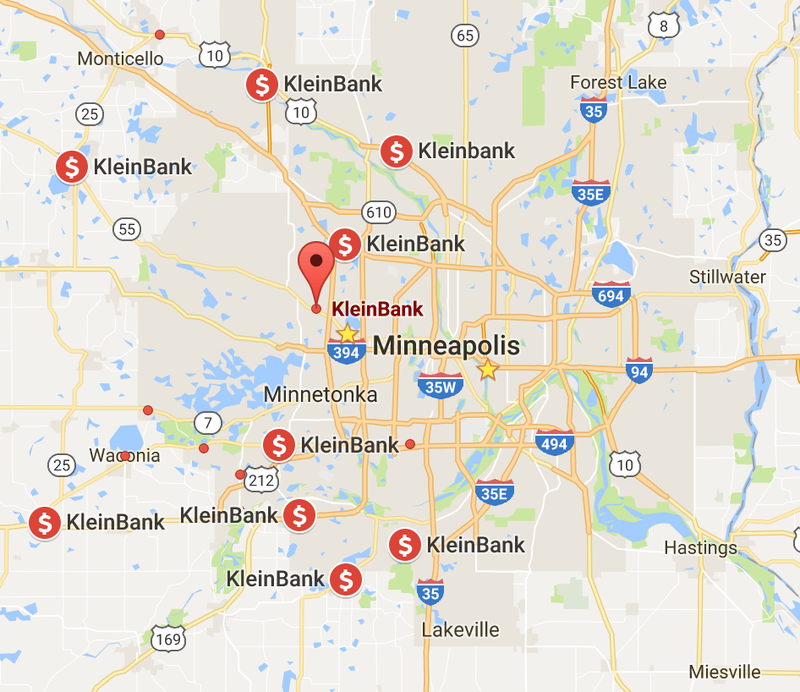 Witt said he was surprised by the government's argument that KleinBank engaged in discrimination by not opening branches in parts of town in which it has never done business, such as St. Paul. "I can tell you this — every bank in the country will be watching to see if the courts agree that the federal government can require that type of change," Witt said. "That seems to be a pretty significant departure" from other Justice Department cases. By the same logic, I assume that upscale restaurants and Mercedes dealers discriminate against the poor by opening downtown instead of "in the hood". 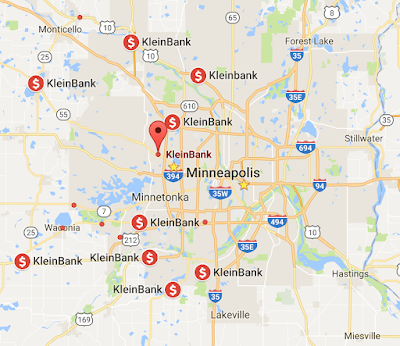 Update: Redlining suit against Chaska's KleinBank tests limits of bias laws - Feds' action against KleinBank will weigh inner-city needs vs. banks' right to location.